It all started with me digging through my mom's makeup collection. She does not have a lot but fulfils the basic "what you need for a dinner event makeup". I started using hers without her knowledge and my first profound love was lipsticks. It was 'lush for blush' from the Maybelline Sensational collection. I don't know what but the feeling of opening up a tube of lipstick, twisting it, seeing that beautiful shade, and smell that yummy chocolate vanilla scent. That's just precious. It's feels like you have a pet unicorn where you can keep in your pocket and only you would know. Precious. I haven't describe how amazing it is the feeling it made me (and everyone else) feel after putting it on. It's like you have awaken from the dead. Like.seriously. Every time I put on my lipstick no matter how pale or bold the colour is, it gives me this amazing vibe of "I'm not a zombie, I'm living my life" kinda vibe. Which is good. It boost up the confidence level sky rocket. No wonder they say "There's always a good lipstick on a bad day". So it started from having one, then multiplied over the years. First, lipstick, and then you start using powders, and bb creams, mascara, and over the years your collection is as tall as your little brother. After a million tutorials you have watched on youtube, and start trying to put on a full face makeup. This is where the trouble begins. Uh-Oh. You start to realise that, your makeup collection is not enough. I don't have that shade of lipstick and blushers, I don't have that contour palette, and I don't have what Kathleen Lights, Nikkie Tutorials and Jaclyn Hills have in my collection! Ugh. Okay, so how did I start doing other people makeup? A night before my best friend's (Najwa) solemnisation, four hours before her henna night. Okay, four hours, four hours before. A text came in, "Babe, you'll be doing my makeup tonight kk , love you". I was shaking when I got the news. Like literally. 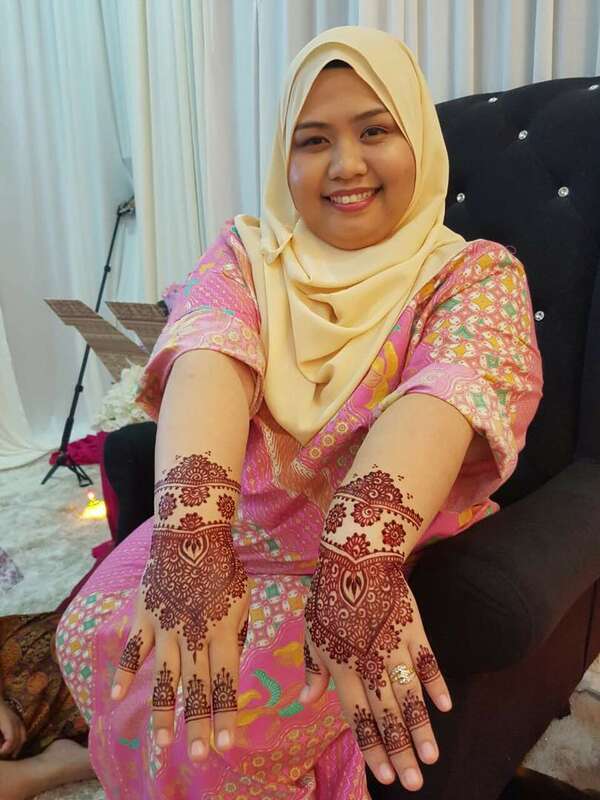 As much as I was happy and excited for her, I was... scared that I might ruin her henna night in front of her other best friends which i barely know. So, I built up my guts, bring a few of my makeup stuff and just did what I had to do. I did her make up for her henna night and she loved it! Not just her, her friends love it too! Her friends loved it that one of them (Farra) asked me to do hers for Najwa's nikah day. I still remember that Najwa said " You have the talent, quit finance la, do make up". But the next day when I saw the real make up artist did her magic, my make up was really nothing as compared to hers. My make up on my best friend, was more of an everyday makeup look, which look good on Najwa, cause she doesn't wear makeup that often. And so my dreams as a make up artist shattered. That was not the end of it. After a few months, I started to apply my makeup skills on other people. From best friends, to families (I made it sound a lot, but really it was like two to three people only 😂). Joined Erin Leola's Demo class in April but mainly for the purpose of my own self knowledge. Which is worth it because I spend RM450 for her class and get to redeem RM300 worth of product at Make Up Forever. Oh, did I mention I had tea with my ultimate favourite make up idol, Kak Ferra Rossa a few days after Erin's class. All with the help of my biras Emira. Thanks Love 😘 . No picture because I was too shy with kak Farah. She was such an inspiration, with her positive vibes. She's the definition of what a sweetheart should be like. It's like when you're standing next to her, she has this beautiful vibe around her pulling you up to become better, which I can't describe. Thank you Kak Farah 💖. Anyways, after April happens, May, June, July, August comes up. Those are the busiest months throughout the year if you're doing finance and your year end is June. I stopped doing make up. Not completely, but I stopped practised on other people. Took the time I needed to straighten up my life. Along with, I came up with the best ideas to start on September. Which is best to save that for my next post 😬. Until then. Hi, I'm Nabeela Khan. A daughter, a wife, and currently pursuing to become a professional make up artist. This blog is where I talk about the things I love and probably the things I do too. You may contact me at ftnnabeela@gmail.com for any inquiries. All images and photos in this blog are personal property of the writer unless it is stated. The use of images without the consent of the writer is strictly prohibited. All reviews are made based on my personal experience towards the product. The reviews given are strictly honest opinion. All items are either bought by me or gifts from friends and family. All Copyrights are Reserved. Simple theme. Powered by Blogger.